The Celebration Ostomy Support Belt is designed to protect your dignity while allowing you to lead an active life. Learn how to measure for a correct fit, get wear and care information, and order your belt with confidence. The Celebration Belt is made to work with the appliance you are now using. The Celebration Ostomy Support belts are clinically recognized for their therapeutic benefits. 1. 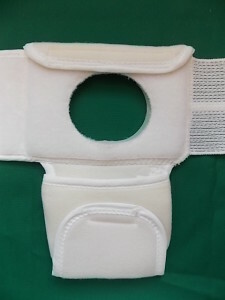 The belt itself is made of a soft Tricot material backing and a Velfoam face material that are sewn to form a pocket to hold the “Stoma Hernia Plate”. The hole through which your pouch is pulled is surrounded by three “Button Holes” that fit the tabs of the “Stoma Shield”. The Open Weave Elastic is sewn to the belt body. All these materials are LATEX FREE. 2. The Stoma Hernia plate works to prevent leaking and give your hernia support. The Hernia plate is made of a soft plastic and manufactured to fit in the pocket of the belt body. It is made with the proper opening for the 2 3/8″, 2 3/4″ and 3 1/2″ Oval opening belts. 3. The Stoma Shield is die cut from a strong plastic material and folded to fit into the “Button Holes” over the opening of the belt. When in place it will allow proper flow into your pouch while preventing irritation or trauma to your stoma from seat belts or work place or sports activities. 4. 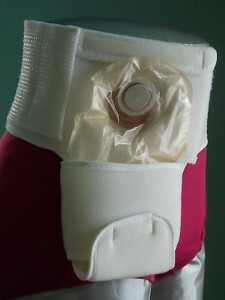 The adjustable pocket below the body of the belt holds your ostomy pouch so that your ostomy bag does not sway as you move, and holds the weight of the ostomy pouch as it fills. This prevents any pulling effect on your wafer and also prevents leaks. The combination of all of these four features makes the Celebration® Ostomy Support Belt completely unique and superior to any other belt. The Celebration® Ostomy Support Belt is an elegantly simple design. Here’s how to wear and care for it. The Celebration® belt is made of a comfortable composite material designed for long life and easy care. Your belt should be hand washed in cool water and mild detergent and allowed to air dry. 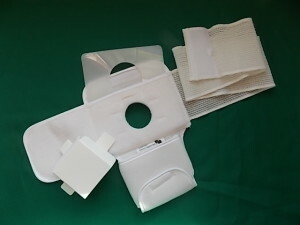 The plastic Hernia plate and the plastic stoma shield can be cleaned with a mild detergent and wiped dry. To wear the belt you will first affix your adhesive stoma wafer. In a two-part pouch system attach the pouch to the wafer. Put the hernia plate into its pocket on the belt. Place the belt opening in front of the wafer and pull the pouch through the opening. Pull the belt ends around your body to a comfortable snug fit. Secure the belt with the Velcro ends. The stoma shield may be fitted into the belt over the belt opening to protect the stoma from irritation or trauma. Fold the parts of the pouch-stabilizing pocket around the pouch. The belt may be worn this way to reduce the pendulum effect of the pouch when contents are in it. When the pouch is empty you may fold the pocket up and secure it with the Velcro strip at the top of the belt. Note: The pouch will not fill in the closed position. The Celebration is made to work with the pouch you are using.It is available with pull through openings of 2-3/8” round, 2-3/4 “ round or 3-1/2” X 2-3/4″ oval for larger pouch systems. The Celebration® Belt is an elegantly simple design that gives support to your ostomy. Celebration® Belts are an elegantly simple design. They are made with the singular purpose of giving comfort, support, and protection to your ostomy. The Celebration belt with the stoma shield in place. This will protect the Ostomate from trauma to the stoma and irritation caused by seat belts.